Ears don't get much droopier than those of the basset hound. There's just something so appealing about dogs with long, droopy ears. That's probably why stuffed toy dogs and cartoon canines feature these appendages. Most droopy-eared dogs fall into spaniel, setter or hound category. If you're looking for a drooper, you can find a dog in your preferred size and shade. 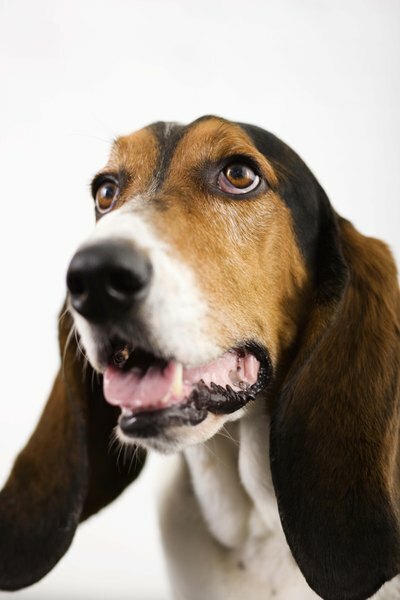 The bassett is a classic droopy-eared hound, who combines a good disposition with a strong tracking sense. He gets along well with other dogs and pets. The bassett's short coat, in standard hound coloration, requires minimal maintenance. Those deep, soulful eyes combined with that wrinkled face and droopy ears just melt your heart. Remember, Snoopy is a beagle. He's typical in that beagles are sociable but independent. Beagles are ruled by their noses, so letting them off the leash is a bad idea in an area that is not fenced. Beagles also get along well with other dogs and cats, but they especially love kids. Cocker and springer spaniels were once the same breed. They're still very similar, although the springer is the larger dog. Both love their people and want inclusion in all family activities. They require daily brushing to keep their coat free of tangles. Available in many colors, they're easy to train and need regular exercise. If you like your droopy-eared dogs large and in charge, the bloodhound could fill the bill. These scent hounds are often odoriferous, so they require regular bathing, grooming and wrinkle-cleaning. The bloodhound is friendly, but he needs to know that you're the boss. The badger dog, as he's known in his native Germany, comes in standard and miniature varieties. The classic long and low canine, you can find doxies with short, wired-hair or long coats. The classic doxie colors are black and tan or red, but other shades with tan points are recognized by the AKC. Doxies are big dogs in a little dog's body. Watch out for back issues, the doxie's downfall. If dog hair triggers allergies in your family, that person might not have a problem with a poodle. While no breed is truly hypoallergenic, the poodle's curly, nonshedding coat doesn't bother some canine allergy sufferers. Available in toy, miniature and standard models, poodles are smart dogs who love their people. If you like to spend lots of time outdoors, a beautiful red Irish setter could be your boon companion. This energetic breed needs at least an hour of fairly strenuous exercise daily. She's a sweet, friendly dog who loves her family. One downside to droopy-eared dogs is an added risk of ear infections. Dogs usually contract ear infections because of yeast or bacteria in the ear canal. Ear mites, foreign bodies or excessive ear wax can lead to infection. Symptoms include constant scratching, head shaking, foul odor or a discharge. Check your dog's ears regularly. If they smell or there's an exudate, take him to the vet for treatment. Are Human Medicines Safe for Dogs?